Catherine the Great: “Glutton” or Connoisseur? After wresting power from her husband, Catherine the Great ruled Russia for 34 years, styling herself as the heir to her westernizing grandfather-in-law Peter the Great. In parallel with military campaigns that added large parts of Poland and the Crimean Peninsula to Russia’s Empire, the German-born Tsarina waged a cultural offensive, buying Western art by the boatload. 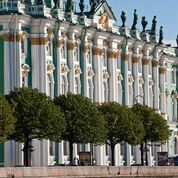 With her first acquisition in 1764 — some 300 canvases earmarked for political rival Frederick the Great of Prussia — Catherine II founded the State Hermitage Museum in St. Petersburg. On the heels of the museum’s 250th birthday, over 450 of her art works star in “Masterpieces of the Hermitage: The Legacy of Catherine the Great” at the National Gallery of Victoria in Melbourne, Australia through November 8. Organized by Mikhail Dedinkin, deputy head of the Hermitage’s department of Western European art, and Ted Gott, senior curator, International Art at the NGV, the exhibition explores Catherine’s wide ranging patronage with some 100 paintings, 80 drawings and her dazzling silver and porcelain commissions intended to trumpet Russia’s wealth. The art unfolds in a series of richly decorated galleries that evoke the storied Hermitage. Dripping ermine and regalia, Catherine herself greets visitors in the opening gallery in an official portrait by Sweden’s Alexander Roslin, one of many artists she recruited to St. Petersburg to fashion her enlightened image. She didn’t hesitate to have her face “photo shopped” with younger, more attractive versions. In today’s parlance, she encouraged her image to go viral, on everything from snuffboxes and medallions to tapestries and portrait busts. Initially, Catherine’s art collecting was a political pursuit, part of a calculated strategy to transform Russia from northern backwater to European superpower. Describing herself as a “glutton” not a connoisseur, she began devouring auction catalogues along with illustrated books on art and architecture. Before long, the hands-on Empress was doling out advice to her Paris art scouts Denis Diderot and Frederic Melchior Grimm, and sending sketches to her favorite architect with detailed instructions. Fittingly, we meet Catherine II surrounded by three of her greatest passions: architecture, cameos, and antiquity. Consumed by what she dubbed a “diabolical” building mania, Catherine transformed swampy St. Petersburg into a splendid neoclassical capital with a distinctive Russian atmosphere. French émigré portraitist Elizabeth Vigée Le Brun likened the neoclassical buildings lining the Neva River to ancient temples. On view are drawings by three of Catherine II’s hand-picked designers — Scotsman Charles Cameron, Italian Giacomo Quarenghi, and Russian Yury Velten. Suffering from “cameo fever,” Catherine amassed a staggering 10,000 tiny carved gems from antiquity and the Renaissance to her own day. 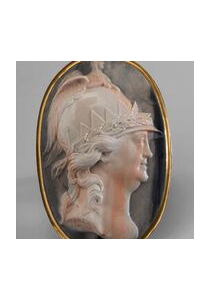 Examples of this obsession are on view — including a jasper cameo portrait of Catherine as Minerva, a 60th birthday present carved by her daughter-in-law, along with Head of Medusa by London’s James Tassie. Also on display are objects from the Sèvres Cameo Service, a gift to Gregory Potemkin, Catherine’s soul mate who many historians believe she secretly married. 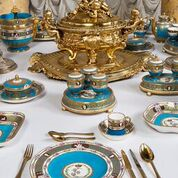 Combining her love of antiquity and cameos, the spectacular 700-piece service nearly bankrupt the prestigious French factory. The next four galleries, organized by Italian, Flemish, Dutch and French schools, give visitors a real sense of Catherine II’s taste in paintings. From her spectacular acquisition in 1772 of the renowned collection of Paris banker Pierre Crozat came many Hermitage masterworks, including the sensuous “Portrait of a young woman” by Titian. The sitter’s soft fur and luxurious green velvet robe illustrate the virtuoso brushwork and splendid palette that catapulted the Venetian Renaissance painter to stardom. The strength of Catherine’s picture gallery was Flemish and Dutch art, as the show’s six Rubenses, three Van Dycks, three Rembrandts and Frans Hals canvas attest. Throughout her reign, Catherine lavished her “favorites” with art and palaces, often purchasing the works and properties back either after their deaths or the end of the relationships. 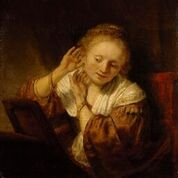 This was the case with Rembrandt’s gem-like “Young woman trying on earrings” acquired for her beloved Alexander Lanskoy whose death at age 26 left Catherine devastated. Along with paintings from Saxony’s Heinrich von Brühl and Austria’s Carl Cobenzl came drawings and there are splendid examples here by Albrecht Dürer, Rembrandt, Rubens, Nicolas Poussin, and Jean-Baptist Greuze. Thanks to Catherine II, the Hermitage boasts some 120 French crayon portraits, the largest such collection outside France. One of the highlights is on view here — the black and red chalk “Portrait of Charles IX” by Francois Clouet. 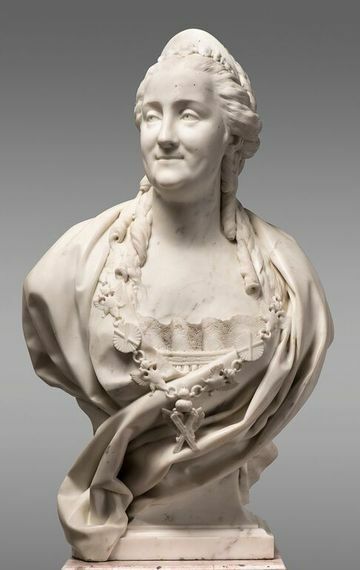 Parisian sculptor Jean-Antoine Houdon, known for his expressive portraits of Enlightenment celebrities, is represented by busts of Catherine and French naturalist Comte de Buffon who she greatly admired. There are also two marble busts by Marie-Anne Collot of French philosophes Voltaire and Denis Diderot, both of whom sang Catherine’s praises. Though she gets little credit, Collot modeled the head of Peter the Great for St. Petersburg’s iconic equestrian statue, known as the Bronze Horseman. 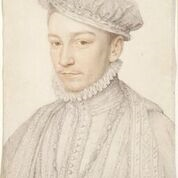 Catherine recognized Collot’s talent and commissioned numerous portrait busts. One of Catherine’s finest and most controversial buys came in 1779 when she snatched some 200 Old Masters assembled earlier in the century by Robert Walpole, England’s first prime minister. A gallery featuring Walpole highlights includes three canvases by Peter Paul Rubens’ gifted, prolific pupil Anthony van Dyck who produced flattering portraits of England’s royals and their courtiers. 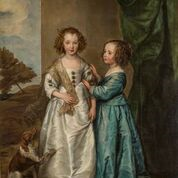 One of his most charming is “Portrait of Philadelphia and Elizabeth Wharton”, the young daughters of an avid patron. Though Catherine’s main interest was Western art, she was also smitten by eastern “exotica” which she displayed at the Winter Palace. Against a backdrop of turquoise and salmon wallpaper, the final gallery features exquisite chinoiserie and Chinese decorative arts. These include intricate gold and silverware and Catherine’s mirrored Chinese toilette set made of filigree, silver, and mother of pearl.